When talking about Advertisement On Line, one of the channels being the most interested by public and has been gradually growing is Mobile Advertising. At the same time it is also the key channel that developers can create revenue from own Applications being created. In this section of interview, we are going to directly talk to Lichi Wu Director of Global Monetization Solutions of Millennial Media, the expert in this field regarding how can Mobile Advertising support Mobile App Ecosystem? thumbsup: Please introduce Millennial Media. Lichi Wu: Millennial Media is the leading independent mobile advertising and data platform. We power the mobile app economy by helping developers and brands around the world succeed through innovative mobile advertising technology and solutions. More than 42,000 sites and apps were enabled to receive ads through our platform at the end of Q1 2013, and we delivered ads on more than 7,500 different mobile device types and models. Through mMedia.com, Millennial Media’s suite of self-service mobile advertising tools, developers can make money, acquire new users, and build a successful business. Lichi Wu: We don’t manufacture handsets, own an app store, or concentrate on search. Mobile advertising is our singular focus. Our platform boasts more than 420 million unique users worldwide and 45 billion monthly impressions. There are many ways developers can take advantage of this size and scale. Developers can monetize their apps across every major platform once they’ve integrated our latest SDK. They can access campaigns featuring a variety of ad formats – from traditional banner ads to innovative rich media and videos ads from the world’s top brands and performance advertisers. This unique campaign mix can deliver both the eCPM and fill rate metrics developers want from a monetization partner. Developers are also tapping into other tools to promote their apps and make the most of every available impression. On mMedia.com, they can put the revenue they’ve earned from monetizing their apps with us toward their own mobile advertising campaigns to drive downloads. Or, they can run a house ad campaign on their own inventory to promote new apps in their portfolio, a paid version of their app, etc. This holistic approach, coupled with our commitment to providing exceptional resources and support, delivers the tools and insights developers need to build a successful business through mobile advertising. thumbsup: How do you foresee mobile ads in SEA the next 3 years? Lichi Wu: We’re excited about the future of mobile advertising in Southeast Asia. Major brands have already seen success in the space, and we expect that to continue going forward. Location is one aspect of mobile that’s resonating with brands in the region. Based on their advertising goals, they have the ability to connect, at scale, with engaged mobile consumers around the corner, around the world, and everywhere in between. We’re also seeing more advertisers in Southeast Asia embrace rich media and video, which means more revenue opportunity for developers through more engaging ad units for consumers. thumbsup: Which mobile operating system that your system can support? iOS, Android, Windows Phone, etc.? Lichi Wu: Developers can monetize their applications across every major mobile platform with Millennial Media, including iOS, Android, Windows Phone and BlackBerry. We also help publishers monetize their mobile websites. thumbsup: How does Millennial Media support the Thai developer ecosystem? How can they monetize their mobile apps? Lichi Wu: Like the app economy, Millennial Media is global. Developers should find a monetization partner that has the ability to scale their business internationally. While it’s important to think about monetizing your current base of users, it’s critical to think about building that base in other markets. With experienced teams located worldwide, Millennial Media is here to help developers earn more revenue and make the most of every impression through mobile advertising. Orangenose Studios is a creative mobile game development company based in Singapore and Taiwan. They have produced a number of hit titles including “Stupidness 3”, “What’s My IQ,” and their latest global hit to rank #1 in the App Store in the US, UK, Canada, Germany and Australia—”Hardest Game Ever 2.” Orangenose partners with Millennial Media to monetize their free, ad-supported titles. iHandySoft is the developer of a portfolio of top utility apps including: iHandy Carpenter, iHandy Level, iHandy Tip Calculator, Alarm Clock Pro/Free, and iHandy Flashlight Pro/Free. The company prides itself on delivering quality to their users and turns to Millennial Media to help monetize their impressions globally. Lichi Wu: Have a monetization plan – Integrate advertising early in the development process to provide an outstanding ad-supported user experience. Build apps with advertising in mind – Be sure your app features a clean, professional design and quality content where advertisers will want to place their ads. Enable more than just banner ads – Integrate the latest SDK to access not only banner ads, but high CPM ad campaigns featuring rich media, static and video interstitials. Pass available metadata – Deliver highly targeted advertising to your users and earn more money. Metadata includes, but is not limited to gender, age, zip code, latitude/longitude, and income. This is data that your users have agreed to share with your application, and given you permission to share with us. Reinvest your revenue – Put the money you earn through advertising back into your business. 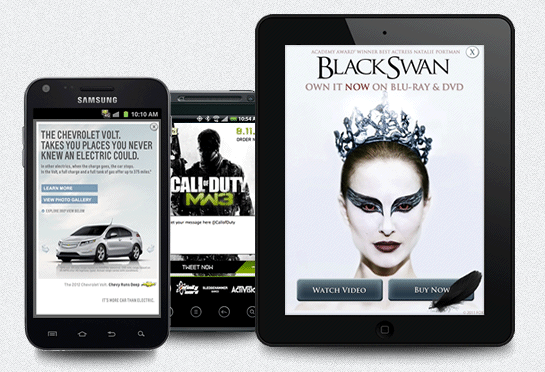 Run a mobile advertising campaign to drive app installs and acquire new users. Be sure to test different banner ads, offers, etc. to see what delivers the best quality users to your applications. Find the right monetization partner – Work with a trustworthy partner that can help you scale your business globally. Millennial Media has offices around the world, is an industry leader in mobile advertising and has tremendous knowledge of the Southeast Asia market. Connect with us. We’re here to help!